I became a fan of Bodine after Veronica radio broadcast a series of four specials about heavy metal on Dutch public radio in January 1984. The specials were aired in Countdown Café, a popular radio show on Friday nights that started in 1982. One of the early hosts was Annet van Trigt. As Kees Baars (manager of Vandenberg, among others) and Alfred "Big Bad Al" Lagarde became hosts in 1984, the show became really dedicated to rock. Alfred was known for his expression "Rock 'n Roll is better than music" on the first Highway Chile album and came up with the expression "beton" to depict the style of music played by heavy bands. Prior to Countdown Café, he hosted "Betonuur" on Tuesday afternoons for VARA radio. Granted; in Dutch the word sounds way better than translated to English ("concrete"), which may be the reason it never caught on and went out of fashion eventually. Countdown Café had a two-hour programme formula of band interviews, LP reviews, background information interlaced with songs and a live concert in the final half hour of the show. The live shows took place in "Anna's Hoeve", a farm turned into a bar between Hilversum and Baarn, The Netherlands. The place burned down on 15 August 2005. The four radio live shows in January 1984 were played by Bodine (6 January), Highway Chile (13 January), Raven (20 January) and, finally, Mercyful Fate (27 January). The band made a great impression on me. Especially the opening riffs of 'The Force' sent chills down my spine. I remember singer Axel Langemeijer announcing "Rock Machine" with the words: “Dit is voor alle mensen die een snor hebben!” (“This song is dedicated to all of you wearing a moustache!”). I recorded the show on a simple mono cassette player and listened to the tape over and over. At that time I didn't realise that I was listening to Bodine's swan song. The band practically fell apart a few months later. I was never going to see Bodine live. In the years to follow, I lost the tape recording but I kept listening to Bodine's records. Contrary to their musical skills though, the name Bodine remained rather obscure. Even after the introduction of the world wide web, no background information became available about the band. Many years later, way into the digital era, I had been spending a lot of time to find online sources about Bodine. Alas, everything that was written about them online kept leading to vague references or dead ends. I tried to get hold of the lyrics for example, but they were nowhere to be found. It became frustrating that no one felt any responsibilitity to dedicate more space to this great band. Then, in November 2008, I stumbled upon two video clips on youtube that gave me the chills. These clips were the first moving images I ever saw of Bodine while performing "Shout" in the studio and "Rock Machine" live. The videos sparked the idea to set up a site at my own initiative. Why shouldn't I do it myself, if no one else would? I had been collecting data for such a long time now, that there would be enough information to post. I discussed the idea with friends and was encouraged by all of them. Also, the comments left on youtube to the Bodine songs were (and are) encouraging. I was attending the Heavy Metal Maniacs 10th Anniversary festival at the Manifesto in Hoorn on Saturday 24 October 2009. The festival bill listed Hysterica, Enforcer, Sad Iron, Vortex, Tygers Of Pan Tang and Exciter. 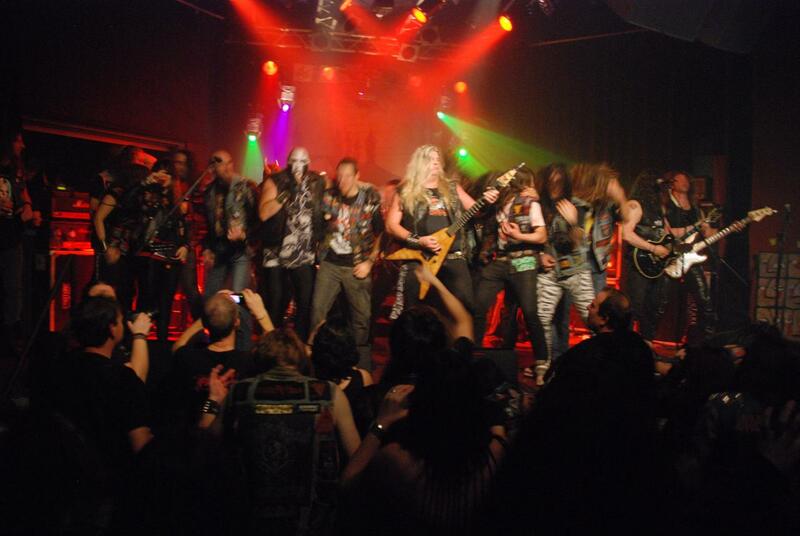 When Vortex played Shout as an encore, the crowd went berserk and joined the band on stage, headbanging their way through the song. For me, it was the first time I heard a Bodine song played live. What better proof was needed that Bodine is still alive in so many heavy metal hearts? It makes one wonder how most of the band members could disappear from the metal scene so dramatically. Apart from Arjen Lucassen, aka Ayreon, who made his mark in the Dutch and the international progmetal scene, none of the other band members joined another band after Bodine split up. All that remained were a few guest appearances by Jeronimo and Gerard Haitsma on M80's "Maniac's Revenge" and by Jan van Feggelen on Arjen Lucassen's "The Final Experiment" and "Into the Electric Castle" albums. To me, it is still mind-boggling, how such talents can vanish entirely. I started this site because I wanted to fill in some blanks in the history of the band which, at the time I launched this site, was short from being obscured entirely. I've offered as many tools as possible for everyone to share details on the history of the band, memories, anecdotes, reviews - anything - is encouraged to do so in the forum! It is RegularRocker's ambition to set the standard for metal-fan pages on the internet, not only summoning the editorial styles used in the heydays of the band, but also in completeness, interactivity, overview and navigation. Dig this! Let's keep the Rock Machine rollin'!